Petaling Jaya Stadium is a multi-purpose stadium in the suburb of Kelana Jaya in Petaling Jaya, Malaysia. 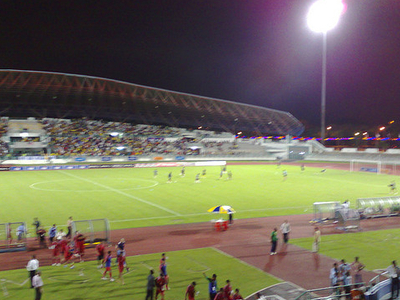 It is currently used mostly for football matches, and previously served as the home stadium to Selangor MPPJ. It was built in time for the 1998 Commonwealth Games, and hosted the Games' rugby union matches. The stadium holds 25,000 people and opened in 1996. The stadium was called MPPJ Stadium then MBPJ Stadium before its name was changed to current name, Petaling Jaya Stadium. Currently its main tenants are local Malaysian Super League team Felda United. The stadium is also used for many local school events, such as Sports Day. The stadium was the start and finish line of the 2011 Petaling Jaya Half-Marathon. In 2013, popular model reality show Asia's Next Top Model filmed it's Cycle 2 Episode 4 at the MBPJ Stadium. Here's the our members favorite photos of "Stadiums in Petaling Jaya". Upload your photo of MBPJ Stadium!